Formed in the 1960s by George and Ivy Garrad, the Sunshine Swing Band is one of very few bands still providing ballroom dance music. 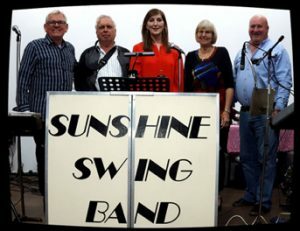 The band has been known by a number of names including The Rhythm Ramblers, The Blue Hawaiian Band and The Ingredients, however, they have played under their present name ‘Sunshine Swing’ for the past twenty or so years. • SE Queensland regional show ball. • Just about every hall in the Sunshine Coast and surrounding district.